Come on! Tell me this isn't the coolest idea? 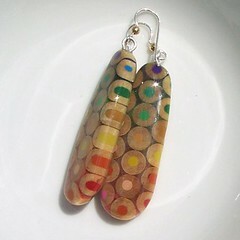 When i saw these steller Pencil earrings i knew Jen Maestre had a brilliant idea! Jen has a shoppe with a name she'll never forget...her own. :) Jen Maestre. 1) How long have you been crafting? 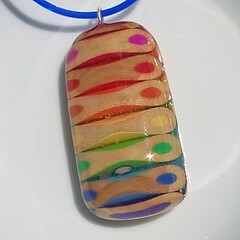 I've always liked making things since I was a kid, but I've only been making the pencil jewelry for about 2 years. 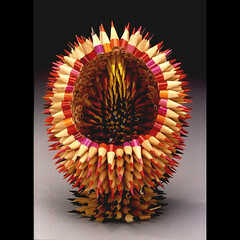 My 'normal' job is making sculptures out of pencils, I started with the pencils in 1999. 2) Did you always craft in this genre? Nope! I was a beader. 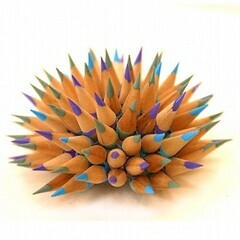 I taught myself a few beading techniques, in fact, I use some of them to construct my pencil sculptures. 3) Who or what inspires you? I'm inspired by Ernst Haeckel's drawings, and by natural forms, and also, by the materials themselves. 4) What challenges have you found while taking your craft into the business world? Well, learning how to run a business has been challenging. It takes a lot of organizational skills, and I am constantly playing catch-up with my paperwork. I'd rather be torturing pencils! 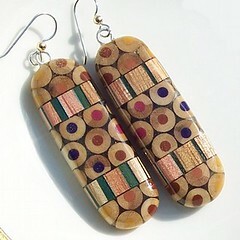 In "Earrings", "Jewelry", "Pendant", "jen maestre", "pencils", "sculpture"